Avery Hood is reeling from the loss of her parents–and the fact that she can’t remember what happened to them even though she was there. She’s struggling to adjust to life without them, and to living with her grandmother, when she meets Ben, who isn’t like any guy she’s ever met before. 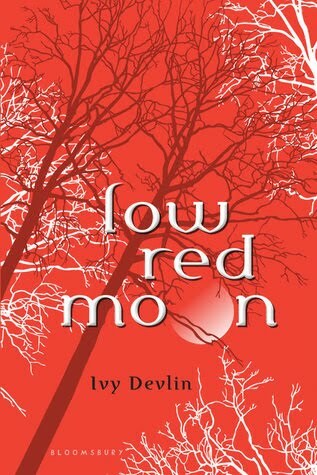 When I picked up Low Red Moon, I was a little wary. Sure I’m a fan of YA fantasy books, and I also love werewolves, but would this book really have anything original to offer? To a point, I’ll say the answer is yes. 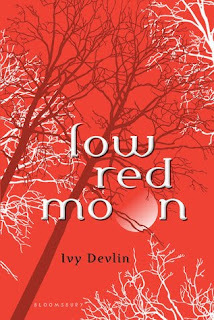 Ivy Devlin has a very unique writing style. The main character, Avery Hood, goes through a lot over the course of the book. And as she thinks or says things outloud, Devlin often cuts off her thoughts mid-sentence using dashes and ellipses (…). I thought that was a neat way of showing confusion, heightened emotion and sometimes shock. It is also a good way to communicate the fact that her mind was probably going 100 miles an hour and her actual words or coherent thoughts couldn’t keep up. The relationship between Avery and Ben really wasn’t very original. It also wasn’t terribly well developed. I am not a fan of having characters form such all-consuming bonds so suddenly and without any real development. But at the same time, they were so intense that I couldn’t help but be captivated by them. I think that, as the series continues, they will be able to develop a more mature connection. I am also very intrigued with where the overall plot of the story will go. The mystery in this book wasn’t hard to solve very early on in the story, but it remained interesting throughout the book just the same. Judging from the way this book ended, I think the sequel will be a much better read all around. So, even though I did have a few issues with this book, there was enough for me to enjoy and I am definitely looking forward to the sequel.